This beauty has been with us since March 2013 and continues to cheer and delight us till this day. 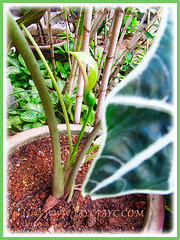 Long live Alocasia sanderiana… may you be happy and healthy always! A very hardy tropical perennial with lovely variegated leaves that are shaped like a kris or keris. Commonly known as Kris Plant because its leaves resemble the wavy blade of a kris or kalis dagger, a double-edged Filipino sword. 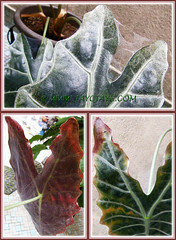 Alocasia sanderiana are easy-growing plants that flourish beautifully with least care. Great plants for beginners in gardening or a school project. These unique and eye-catching plants are popularly grown for their ornamental and enduring foliage. The V-shaped and glossy deep-green leaves are very large and brilliantly marked with prominent white veins that really stands out in wonderful contrast. Common Name: Kris Plant, Keris Plant, Sander’s Alocasia, African Mask. Etymology: The genus name, Alocasia is derived from the Greek word, kolokasia, meaning lotus root which resembles the root of this plant. The species epithet, sanderiana is named after Henry Frederick Conrad Sander (1847-1920), a German-born British nurseryman. Origin: It is native to the Philippines Islands. So unfortunate that this plant is classified as a critically endangered species there. It widely cultivated elsewhere, including Malaysia. 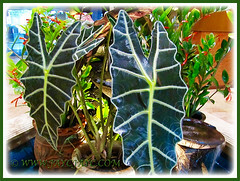 Features: Alocasia sanderiana is from the genus Alocasia that consists of approximately 79 species. An upright-growing tropical perennial that can reach 2 m tall in its native habitat but shorter, about 1.2 m in cultivated specimens. Its evergreen leaves are V-shaped, deeply lobed and variegated with a deep-green sheen and distinctly marked with large silvery white veins. The margins of the leaves have silvery borders too. The leaves are about 30-40 cm long and 15-20 cm wide. Leaves have deeply undulating margins or edges, resembling the wavy blade of a kris dagger, hence its common name, the Kris Plant. Leaves undersides are purplish-red in colour. The petiole of its leaf is about 60 cm long, emerging from its rhizome or rootstock which is vertically placed. It produces a creamy-white inflorescence that is about 11-15 cm long, with a green and white spathe that covers the spadix that bears the tiny flowers. Female flowers are grouped at the lower part whereas the male flowers are at the top. They will be followed by inedible orange-red berries. 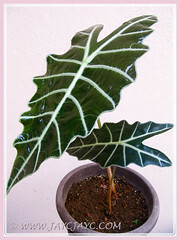 Culture (Care): Alocasia sanderiana or Sander’s Alocasia grows easily with least maintenance. Moisture: Moderate to high water needs. Water regularly as it needs constantly moist soils. It benefits from humid conditions. Others: Remove withered or sunburnt leaves and deadhead to keep it aesthetically attractive. Wipe the foliage regularly to keep it dust-free. Feed once monthly with a balanced liquid fertiliser. No known serious pests or diseases though prone to red spider mites. Thus, do check regularly for tell-tale signs of fine silk webbing to prevent heavy infestation of them which can destroy the plant. Learn how to revive a diseased plant here. For subtropical and temperate regions: Hardiness: USDA Zone 10-11. An eye-catchy evergreen shrub to plant in tropical and subtropical regions. 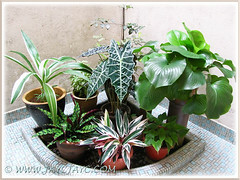 Provide sufficient sunlight outdoors and bright light, warmth and humidity if grown indoors as a houseplant. 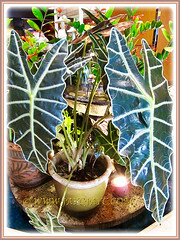 Alocasia sanderiana often rests in winter due to poor lighting. Water moderately from spring to early autumn but keep fairly dry from then onwards into winter. The plant will flower at any time during the growing season. Advisable to propagate by dividing the rhizomes in spring. Propagation: By division of the rhizomes, planting them above the soil line to prevent the leaves from decay at the base. 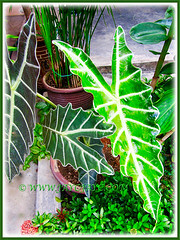 Usage: Use Alocasia sanderiana as an excellent ornamental plant in the garden or landscape for its large, dramatic and variegated foliage. Most suitable too for container planting and raised planters. 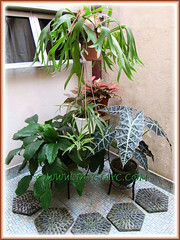 Great as an eye-catchy houseplant for indoor decor, especially in non-tropical climes or located at the courtyard, patio and deck, outdoors as a standalone specimen. It is ideal to be planted amongst other companion foliage plants to add structure and interest to your garden. Moreover, its deep green glossy leaves are distinctly prominent with white veining in beautiful contrast. It is also known for its medicinal or folklore use as a decoction to treat headaches.